Its quick, rough and not that good, but it's the first time I've been inspired to put pencil to paper in about a year, so I thought blogging it might help keep me going. 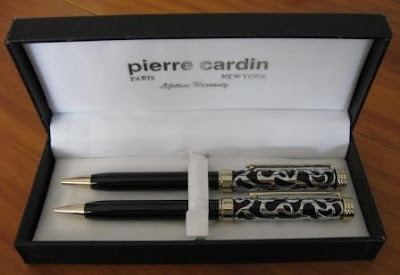 My defences were down when I saw the auction for this Pierre Cardin ballpoint pen/pencil set. The seller claimed to have bought it about 10 years ago from a genuine Pierre Cardin retail outlet in New York, and I hit that "Bid" button. Black plastic body with chrome metal filigree overlay sleeve on the top half of the body. The other metal trims are a very light gold colour. I’m not really sure what metal that would be. 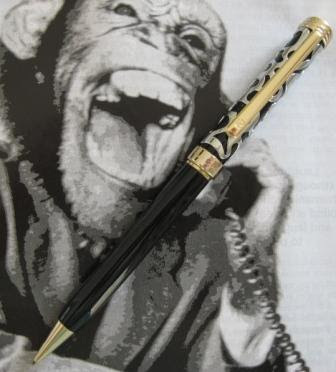 Fancy filigree work on pencils is not usually to my taste, but I must admit this pen set is rather attractive. As you might expect, all that metalwork makes for a heavy pencil, and one that is quite top heavy. 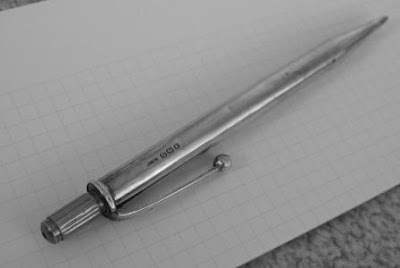 The mechanical pencil is a screw action mechanism – wind the top half of the body around to propel or retract the 0.9mm lead. 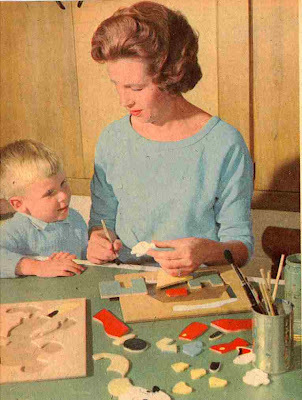 The top half of the body pulls off to access the eraser, and lead storage beneath the eraser. As usual though, leads are replaced via the tip. 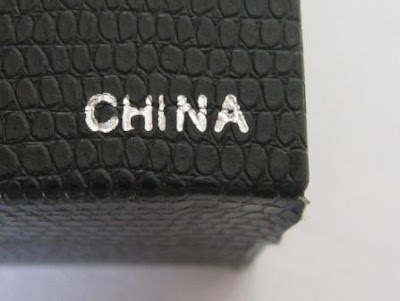 “Pierre Cardin” and “China” are engraved on the middle body ring, and the PC logo on the tip of the pocket clip. There are no model numbers or designations to be seen. The box has various Pierre Cardin markings. I must say I am surprised at the prominence given to this items Chinese origin, and I would have expected another source for a brand name like Pierre Cardin. Despite its claimed age, this set is in very good condition, although the box has a little wear and tear. 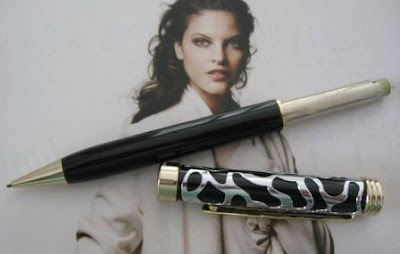 Of course the world is awash with fakes, and I’ve got no idea what a real Pierre Cardin pen set is supposed to look like. So whilst I assume I have a real Pierre Cardin, someone could have just as easily played me for a chump and sold me a Peter Cardigan. At the end of the day, I got the set for a rather paltry sum, and I’m happy whatever PC it is. I bought this pencil from a Morning Glory shop a few years ago, and it has been languishing in storage ever since. 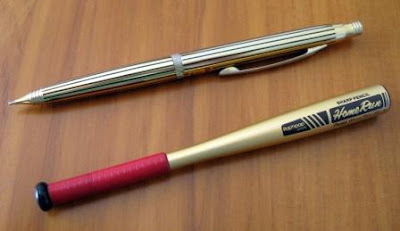 The Japanese writing instrument companies are great exporters and they have a global presence, but their Korean competitors are much lesser known. Recently I was contacted by a couple of young Korean collectors and had the opportunity to learn some things from them. 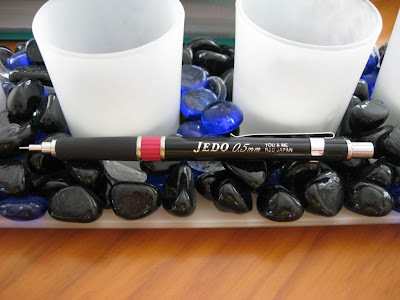 I had always thought that Jedo was a Korean brand of mechanical pencils, but apparently I’m completely wrong. 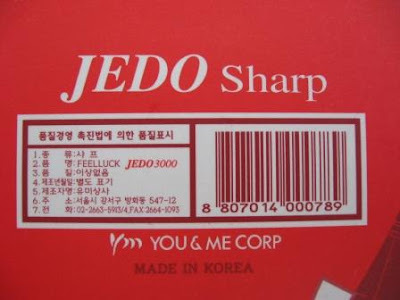 I’m told that in Korean, Jedo can be used as a noun or a verb, "Je" means make something, and "do" means graph, thus Jedo translates as graph work. 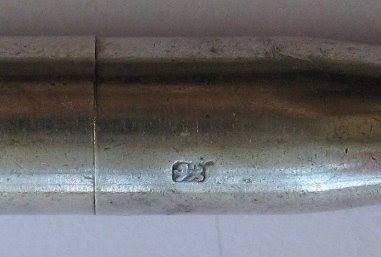 Many technical or drafting style pencils are labelled Jedo, and it appears the word is not trademarked or brand registered so basically anyone can call their pencil a Jedo this or that. 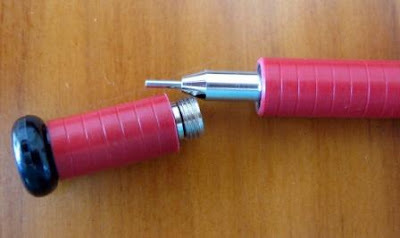 Websites of European companies often divide their mechanical pencils into two categories – drafting and office (non-drafting). 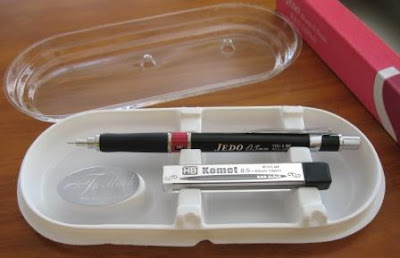 Similarly some Korean websites have two mechanical pencil sections – Jedo and non-Jedo. 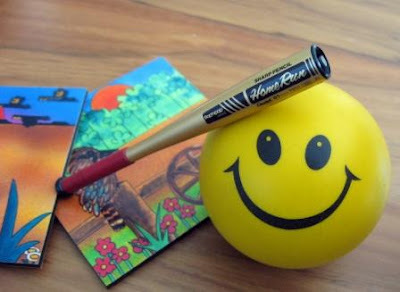 You & Me Corp are a reasonably well-known Korean stationery company and “Feel Luck” is one of their main brands. 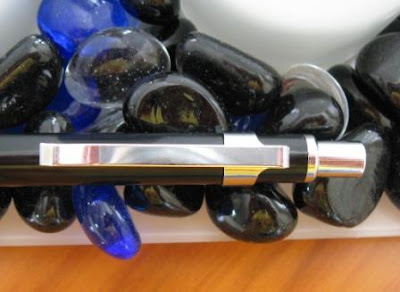 I don’t know if they manufacture their own mechanical pencils or buy from another manufacturer, but there seems too be a lot of Jedo variants and clones so I suspect a small number of manufacturers and many brand distributors. 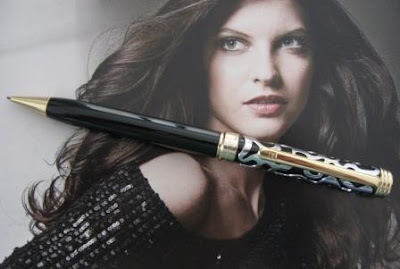 The You & Me Corp ‘Feel Luck’ Jedo 3000 Sharp 0.5mm mechanical pencil comes in a little vacuum formed plastic clamshell which is itself inside a cardboard package. This is really all just retail display material, not the sort of thing you would be likely to keep after you have started to use the pencil. In western markets many might consider it excessive packaging. A tube of You & Me ‘Komet’ refill leads is also supplied as part of the deal. 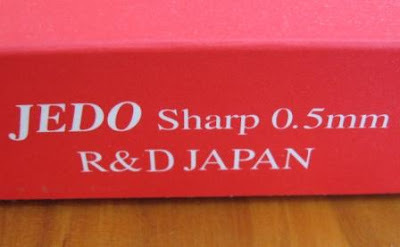 Although the small print specifically states “Made In Korea”, the wording “R & D Japan” is prominent on the packaging and the products themselves. It seems that a Japanese association is highly valued by at least some Korean marketers. At first glance this pencil is reasonably appealing. Black body, chrome trims, fairly classical proportions. The only thing I have against it stylistically is the size and font of the printing on the barrel. It just doesn’t look right to my eyes. The pencil is quite lightweight, much lighter in the hand than I expected. For some unknown reason I expected a rather substantial weight. The grip section is plain black smooth rubber. The compound has a very small amount of give under hand pressure, and is not particularly ‘grippy’. I don’t really think it enhances your grip much. 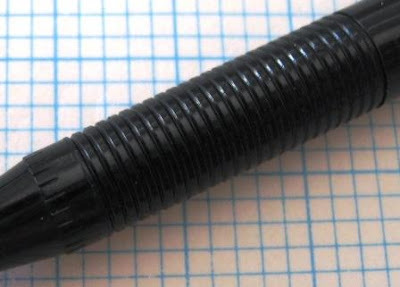 The tip section is a classical set of step-downs culminating in a 4mm thin pipe lead sleeve. Obviously intended for graph work and drafting as all Jedos should be. 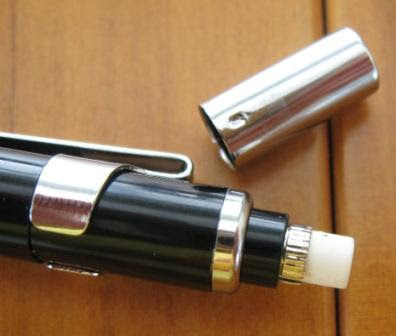 The lead sleeve is not retractable so equally obviously it will wreak havoc in your pocket. 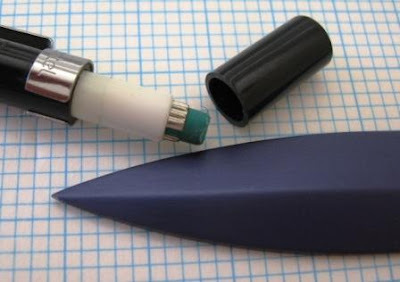 In the middle of the body there is a lead hardness indicator, which is a simple twist ring without any detent system. 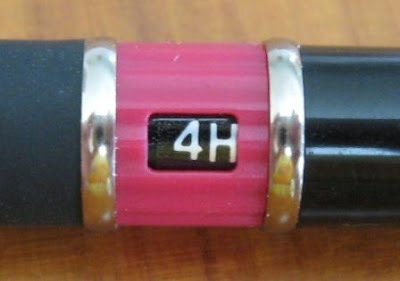 The marked hardness grades are 2B to 4H including F. The printing of some of the hardness grades is not quite correctly aligned with the centre of the viewing window. It is only a minor imperfection, but one that top end manufacturers should not make. Also, the colour of the hardness ring seems a little washed out and cheap. I’m sure they could do better. The pocket clip is springy steel and perfectly functional. The lead advance mechanism is a push top ratchet. Ten clicks of the top button will get you 7mm of lead. The mechanism feels like it is good quality - smooth yet firm and positive. 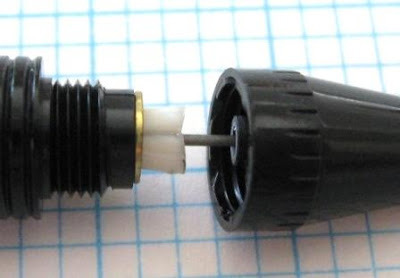 There is a small eraser beneath the push top button, and access to the lead refill chamber is beneath the eraser. 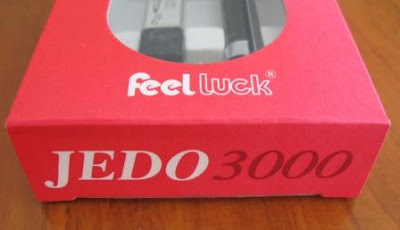 Despite all the marking on the body, the specific model number ‘3000’ is not marked on the pencil. 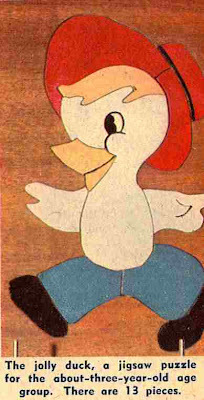 That’s one of the reasons why I previously thought Jedo was the brand name. 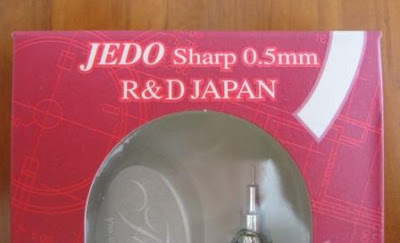 The ‘R & D Japan’ might lead some to believe this pencil was of Japanese manufacture. Overall then this pencil seems perfectly reasonable, although as with all my reviews I can’t comment on its long term durability. Best Points – I like the look of the tip section. Mechanism feels good. Not So Good Points – Lead hardness indicator ring – its functional but not so pretty. 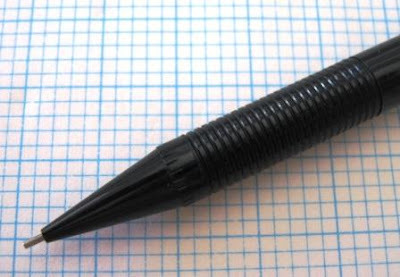 Dimensions – Length 139mm, diameter 9mm at main body. Balance point about 70mm up from the tip. It’s been yonks since I had a poll. Well, back in May 2008, Poll 6 enquired about how many regular readers of this blog there were out there. I’m quite interested in reader statistics, and now I would like to find out about your geographical distribution. So, if you self-describe as a regular reader of this blog then I would appreciate you participating in the current poll. My website stat meter tells me the location of visitors to the blog, but most visitors are not regular readers. I must apologise to those of you whose country is not specifically given as a poll option. Please take some comfort from the fact that my own country is not listed, and I would have to tick the “Elsewhere” box. The poll gadget just doesn’t allow for enough choices of answers. For those whose country is not listed please click the appropriate regional area, and if you want to be more specific than feel free to also leave a comment noting your country. Anyway, thanks for participating. Now I know many of you will have already seen The Bat on various other blogs, but since it’s so unique and I paid an arm and a leg to get hold of one I thought I deserved to put it up on my own blog. To be precise it’s a Pentel PBS1 0.5mm “Home Run”. Not sure, but Germ thinks the PBS1 was made in 1984/85. 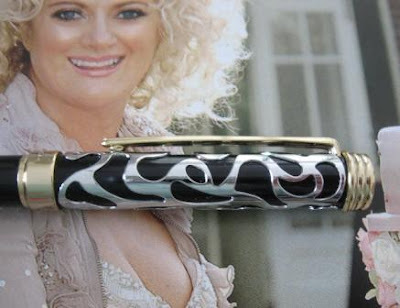 At first glance there is no way it’s a pencil. Batter Up! But the grip unscrews. Stick it in the top end. Phooorrrr! Now we’re talkin’! It was recently pointed out to me that my blog has had its 3rd Anniversary, so I thought I had better do a little anniversary piece. Three Years. That’s a fair while. 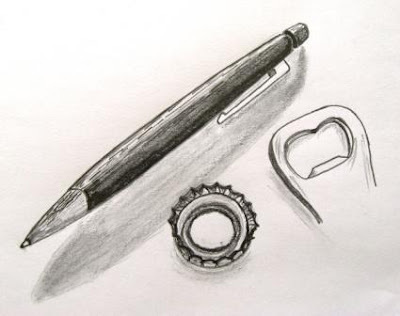 Inspired by the now defunct Pencil Revolution I started this blog back on 30 January 2006, and I remain surprised at it’s longevity and popularity (294 posts and about 330,000 hits, 720,000 page views). I’ll hope to write a little something celebrating my 5th Anniversary and 500th posting in a few years. Seeing this is an anniversary piece, I guess a little something personal is in order. For quite a while now I’ve been thinking about this blog - things like why do I do it, what do I get out of it? I was recently sorting through some old stuff in storage and found something that got me thinking. They say that everyone has their 15 minutes of fame. 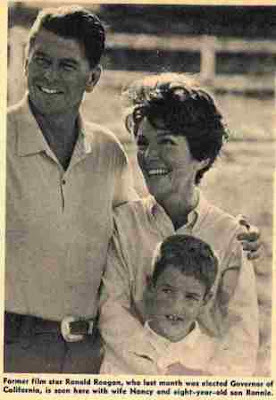 Maybe I had mine back when I was a little fellow in the 60’s. 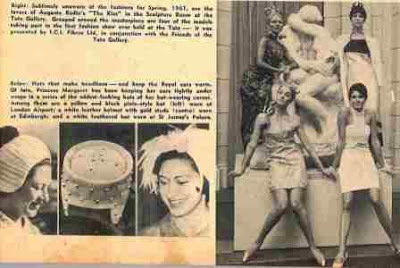 Here I am from back then in full colour double page glory in our most popular “women’s” magazine. 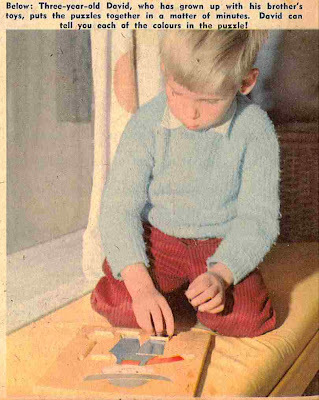 Ostensibly the article is about my older brothers thriving after-school business of making educational toys, but he only started making them because I wanted some new jigsaw puzzles, so really it’s all about me! Me, me, me, me, me! I was chief toy tester and reviewer, maybe that’s why I like writing this blog - I was born to be a product reviewer? I haven’t looked at this magazine for decades, but I enjoyed taking a little journey back in time. 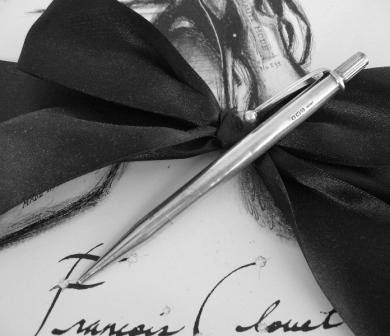 I recently won this vintage pencil at auction, and it has turned out to be a little bit of a surprise package. It’s in “average” condition – meaning no major dents, scratches, etc but certainly plenty of minor surface wear and tear, and the pocket clip is loose. I’ve had a couple of goes at polishing it, but some more work is still needed. Tarnish. That’s one aspect of silver pencils I don’t like. There is no danger of the pocket clip coming off, it’s just the attachment flange has worked a little loose. 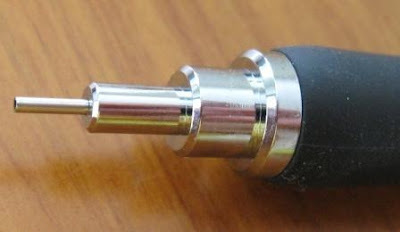 It is a screw mechanism pencil – you wind that top knob around to advance or retract the pencil lead. 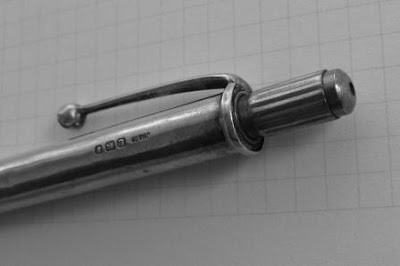 The pencil is solid silver. 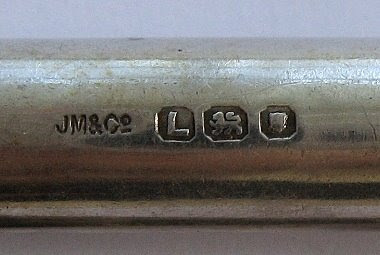 Hallmarked for London, Sterling Silver, 1946, by the maker JM & Co. With British hallmarks the main part of a multi-part item is fully hallmarked and then other separate component parts are marked with just the metal type/purity stamp – in this case the lion for “sterling silver”. The first surprise for me was the makers mark “JM & Co”. This is the makers mark for Yard-O-Led of similar age. I haven’t been able to find out much about JM & Co. 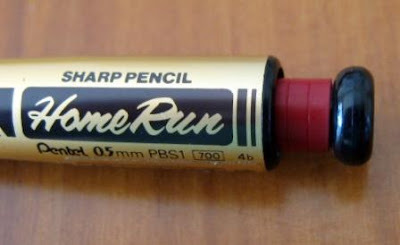 The existence of this pencil implies either YOL also made non-YOL brand pencils or perhaps more likely JM & Co were silversmiths making under contract to YOL, and also did other pencil work. 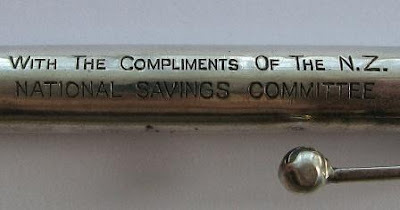 As you can see below, the pencil has a “With compliments…” inscription. The inscription led me to my second little surprise, learning about this previously unknown committee. A quick bit of net-searching has revealed they were in charge of raising public money to pay for the war effort back in the 1940’s and were quite successful. “Money for guns”. Some of their advertising posters are shown below – in English and Maori. I guess the recipient of the pencil was a worker for the committee, or a big investor.